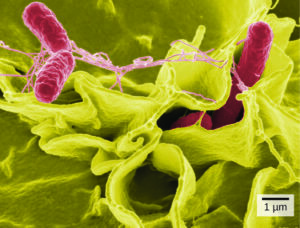 In multicellular organisms, cells of one particular cell type interconnect with each other and perform shared functions to form tissues (for example, muscle tissue, connective tissue, and nervous tissue), several tissues combine to form an organ (for example, stomach, heart, or brain), and several organs make up an organ system (such as the digestive system, circulatory system, or nervous system). 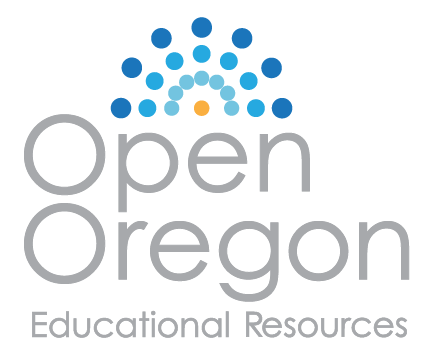 Several systems functioning together form an organism (such as an elephant, for example). To give you a sense of the size of a cell, a typical human red blood cell is about eight millionths of a meter or eight micrometers (abbreviated as μm) in diameter; the head of a pin is about two thousandths of a meter (millimeters, or mm) in diameter. That means that approximately 250 red blood cells could fit on the head of a pin. Figure 2 (a) Most light microscopes used in a college biology lab can magnify cells up to approximately 400 times. (b) Dissecting microscopes have a lower magnification than light microscopes and are used to examine larger objects, such as tissues. Most student microscopes are classified as light microscopes (Figure 2a). Visible light both passes through and is bent by the lens system to enable the user to see the specimen. Light microscopes are advantageous for viewing living organisms, but since individual cells are generally transparent, their components are not distinguishable unless they are colored with special stains. 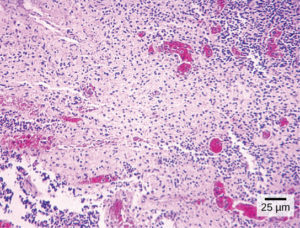 Staining, however, usually kills the cells. 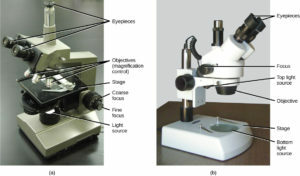 A second type of microscope used in laboratories is the dissecting microscope (Figure 2b). These microscopes have a lower magnification (20 to 80 times the object size) than light microscopes and can provide a three-dimensional view of the specimen. Thick objects can be examined with many components in focus at the same time. These microscopes are designed to give a magnified and clear view of tissue structure as well as the anatomy of the whole organism. Like light microscopes, most modern dissecting microscopes are also binocular, meaning that they have two separate lens systems, one for each eye. The lens systems are separated by a certain distance, and therefore provide a sense of depth in the view of their subject to make manipulations by hand easier. Dissecting microscopes also have optics that correct the image so that it appears as if being seen by the naked eye and not as an inverted image. The light illuminating a sample under a dissecting microscope typically comes from above the sample, but may also be directed from below. In a scanning electron microscope (SEM) (Figure 3b), a beam of electrons moves back and forth across a cell’s surface, rendering the details of cell surface characteristics by reflection. Cells and other structures are usually coated with a metal like gold. In a transmission electron microscope (TEM), the electron beam is transmitted through the cell and provides details of a cell’s internal structures. As you might imagine, electron microscopes are significantly more bulky and expensive than are light microscopes. All new cells arise from existing cells.